What do I need to do if this change moves forward? It is anticipated that the US Postal Service will forward mail for one year, based on precedent of ZIP code boundary changes. During that time, you can leisurely update your ZIP code for any mail you receive. This is the only inconvenience to the ZIP code change. You can update your address online in many instances, and the total time necessary is very minimal if you update your address as you pay your bills. Will my taxes go up? This proposed change is how the US Postal Service classifies your address. If you live at Lake Shawnee, you are a Jefferson Township resident, and that is not changing. The real estate taxes you presently pay should not be affected by a mailing address adjustment. The township tax assessor knows that Lake Shawnee is in Jefferson Township, therefore, this mailing address change should not affect your assessment. What does the current ZIP code boundary look like? 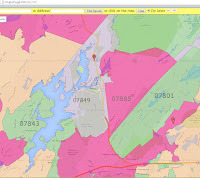 As you can see in this map or the photo to the right, ZIP code 07849 surrounds Lake Shawnee to the north, west and south. To the east is non-residential, and part of the North Jersey Highlands in Jefferson Township. The Lake Shawnee Reservation has two entrances and one exit by vehicle. The homes surrounding the egress and ingress are served by the Lake Hopatcong, NJ 07849 post office, making such a change presumably more efficient for the US Postal Service. In fact, Gatwyn's, which is accessible by entering the Lake Shawnee development, has a Lake Hopatcong mailing address, as do the homes on Mallard Road. I love your idea. How can I help? Glad you asked. The first wave of mailing form letters has concluded. The US Postal Service sent surveys in early November 2016 with a deadline of return being 30 days later, December 8, 2016. Third, you can contribute to a fund supporting the cause. The fundraiser will help with costs for advertising to inform and educate those affected by way of targeted post cards, lawn signs, Facebook advertising, and Jefferson AIM ads. If you wish to contribute by cash, check, or money order, you can use the Contact link and I will provide an address. I already use Lake Shawnee or Jefferson Township on my mail. Why make this change? Some residents use either Lake Shawnee or Jefferson Township on their mail without issue. Some even use the ZIP+4 designation, which identifies a smaller geographic area within the first five digit's footprint. While these are great options, there are still numerous reasons for the ZIP code change as explained in the post, "Why Change Lake Shawnee's ZIP Code?" Furthermore, anecdotal evidence suggests that not using the official mailing address city name has caused some mail to be delayed or returned. Lastly, while this ZIP code boundary change may be a small inconvenience for some, the long term gain for all current and future residents is far greater. Lastly, according to the US Postal Service, you are advised not to simply substitute the preferred city name before the ZIP code in an address line. US Postal Service computers have internal checks that compare the ZIP code with the proper city name, and if the two do not match, mail can be misdirected. Why is our ZIP code 07885? Great question. In the 1950s, The Lake Hopatcong area was served by the Wharton RFD (rural free delivery). In the mid to late 1960s, Lake Hopatcong began home delivery with their own post office. Unfortunately, some residents did not want to take the time to update their addresses, keeping the Lake Shawnee Reservation in a Wharton mailing address to this day. Who is the Lake Shawnee ZIP Code Change Committee? The Lake Shawnee ZIP Code Change Committee (LSZCCC) is a community group with the common interest and goal of changing the ZIP code for residents of Lake Shawnee. Will my mail pickup be closer? If you presently pickup vacation mail or packages at the Dover Annex on Richard Mine Road or the Wharton Post Office, the anticipation is that the Lake Hopatcong Post Office would handle this if the ZIP code boundary change occurs. If you have ever been in the Dover Annex, you will greatly appreciate this change as it is a warehouse, and not a retail location. Furthermore, the Lake Hopatcong, NJ 07849 post office is less than half the distance of the Dover Annex on Richard Mine Road. What about our mail carrier? It is too soon to tell how the US Postal Service might handle the existing carrier route. They may simply adjust the ZIP code boundary and keep the existing carrier routes to minimize change. Alternatively, they may re-assign carrier routes for efficiency. While we may get a new carrier, we can certainly work toward keeping our existing one through discussions. It should also be noted that this ZIP Code boundary change is a lasting improvement, but our mail carrier may move or retire at some point. It is also worth mentioning that postal carriers are part of the American Postal Workers Union or the National Rural Letter Carriers' Association, both of which have strong labor protections. Why not request our own ZIP code? Requesting a new ZIP code for a small community such as Lake Shawnee is not practical for the US Postal Service. Additionally, requesting a new ZIP code for Jefferson Township, is a far larger request of the US Postal Service as it affects much more than Lake Shawnee. Jefferson Township does not have it's own ZIP code, but there are four known ZIP codes used within the township. Lake Hopatcong is one such ZIP code, and one that is not a municipality, but is generally known to be the Lake Hopatcong side of Jefferson Township. At this time, there is no anticipation of being required to make an immediate change. It is expected that when your driver's license is up for renewal, you would make the change at that time. You are not actually moving and this is only a ZIP code change. You can easily update your address online though! What about my deed, title, and mortgage? With regard to your mortgage, deed, and/or title, you do not need to take action. Upon sale or re-finance of your home, the title company will make the necessary updates. My title currently reflects Jefferson, NJ 07849. My deed shows Lake Hopatcong, NJ 07849, and my mortgage reflects Jefferson, NJ 07885. This was a discussion with mortgage and title professionals. What about my homeowners or auto insurance? Quotes were performed various ways to make a determination if rates would change, and there was no observed effect. This was a discussion with insurance professionals. What about my bank account checks? There is no need to order new checks. Many people use existing checks when moving and only update their address when it is time to order new check stock. GPS devices will update automatically over time. New cars purchased with GPS will eventually know Lake Shawnee as Lake Hopatcong when keying in the city, rather than Wharton. Existing GPS devices will work the same way they have been, knowing Lake Shawnee as Wharton, rather than Jefferson Township. Some devices can be updated manually, which is common practice due to the numerous changes that occur annually. GPS on your mobile phone will update automatically over time. Will my properties values go up? This is debatable. The ZIP code change should be positive for buyers and homeowners as an intangible, but is difficult to quantify. Realtors and appraisers know that Lake Shawnee is in Jefferson Township. However, many buyers use sites such as Zillow and Trulia, so having Lake Shawnee better represented, could increase the buyer pool, which could increase competition, and drive up prices. One person inquired about house flippers. If a home increases in value due to a ZIP code change, the purchase and sale price are both higher, resulting in a negligible difference in profit. I have lived here for 20, 40, 50+ years. Why change now? The Lake Shawnee community was created by constant change. With so much business now taking place on the internet, and with one year of mail forwarding by the US Postal Service, the impact and timing of reordering stationary is expected to be negligible. Does a change in ZIP code affect my child's school? No, your residency is not changing. 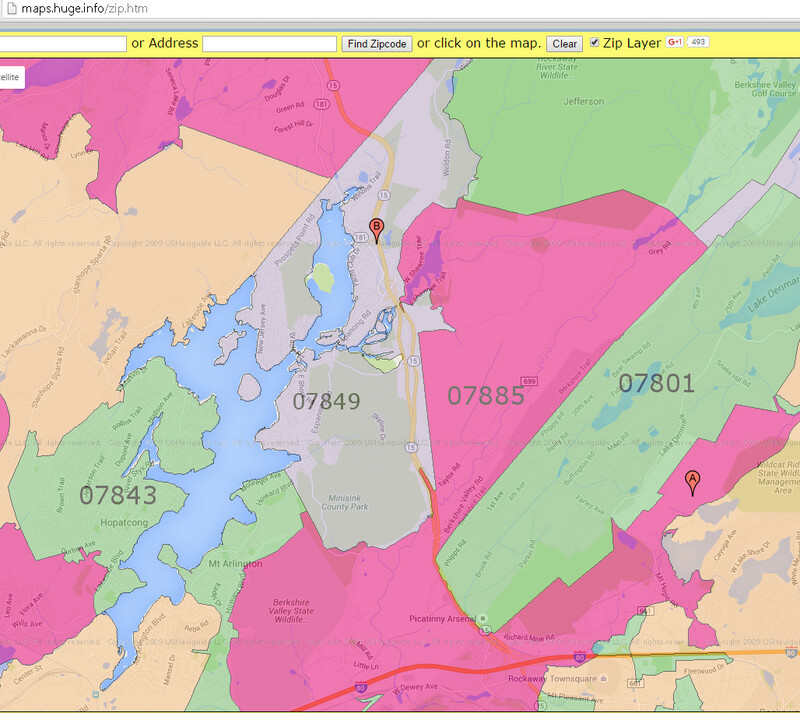 Where can I learn more about ZIP code changes? This FAQ is not intended to provide advice or guidance to uniquely specific issues or circumstances. The questions and answers posted on this site are provided for informational purposes only and are not intended and should not be considered as legal advice. Any statements determined to be inaccurate will be promptly updated. Visitors to this web site agree to hold harmless and indemnify the site's creator of any and all claims and actions arising from information posted to this web site. Why Change Lake Shawnee's ZIP Code?